Meisterin Christian presents a pair of linen hose for the categories One Metre Material Project; Hitting Below The Knee; Togs, Togs, Undies. Possibly also Remake, Reuse, Refashion, Reconsider, and a dress based on a portrait of Katharina von Bura for the categories Remake, Reuse, Refashion, Reconsider and Counting (on) Sheep, and finally a haube for The Neck Best Thing. 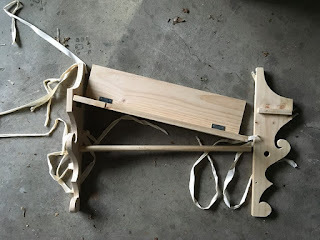 I first made woollen hose some years ago, and then after a particularly hot and wet Canterbury Faire one year I decided I needed some linen hose to either wear alone, or as a lining layer for woollen hose. However my pattern had disappeared. Having torn apart my sewing room, I gave up on the project. Last year I decided it was time to make some more hose, and after failing to find the pattern yet again, made a new one. Which I then promptly lost. While looking for some beads for another A&S challenge project I found last year's pattern. So, using a (less than a metre) scrap of the same linen I used for my child's shirt project in this Challenge, I whipped up these linen hose. Pictured as worn below (the foot-selfie makes my feet look alarmingly small). Hose made from woven linen fabric are recorded in 16th C sources and at least one extant example survive. These may have been worn as lining for woollen hose (so that the woollen hose can be worn repeatedly without washing while the lining pair could be cleaned frequently), and/or they were probably worn alone in warmer weather. 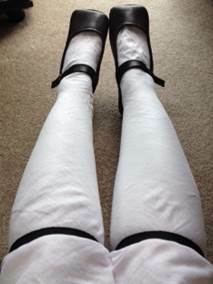 The hose were cut on the bias in order to stretch and conform around the feet and legs. Garters are worn to hold the hose up. The seams here are stitched in linen thread, overcast stitch for strength, with the seam allowances flat felled on inside for comfort. For Yule 2017 I decided that as this winter event included outdoor activities I really needed to wear something warm (and made of more practical fabrics than say silk or brocade). It was not cold enough for my really heavy woollen dress, and too cold for my light woollen dress with the slashed sleeves; ideally I needed something in between. It occurred to me that I had an unfinished green woollen dress in the naughty corner (that’s where annoying, frustrating, or uncooperative A&S projects are sent until they learn to behave) which I had started years ago and not finished because a) I didn't have much use for warm clothing at that point, and b) the woollen fabric was somewhat annoying to sew). This seemed like a prime opportunity to get a new dress and also knock off a couple more A&S Challenge categories in the process. Of course this all occurred to me the night before the event, which is not the ideal time to decide you need a new dress. After some excavation I recovered the dress and found that there was only about 30 mins work (tidying the lacing rings and waist fastenings), and a brustfleck (the brocade breast-band), needed to make the dress wearable. Since it was the night before the event, and I'm not completely crazy, I found an brustfleck from another old dress and covered it in a scrap of brocade from my stash, and after a couple of hours work I had a new, never-been-worn dress. And to add to the fun, I also quickly cobbled together a haube (the hairnet/snood type thingy Katharina is wearing in the portrait) from a (purchased) black hairnet and a gold headband I had begun for another haube project. 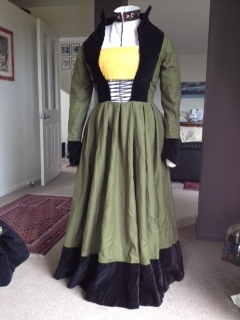 I didn't get any photos of the dress at the event, so the photo below is of the dress on a dressmakers form. 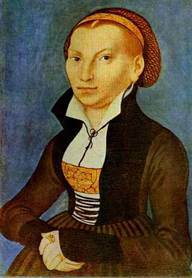 This dress is based on the 1526 portrait by Lucas Cranach of Katharine von Bura (below). Katharina von Bura was the wife of Martin Luther (he of the 95 theses). The size, shape and placement of guards (black trim / bands) on the bottom of the skirt and the back of the dress are conjectured from dresses in other portraits of the period. Her Excellency writes to inform of her appearance in a morality play at Canterbury Faire. This falls into the categories Break A Leg, and Out Of Your Comfort Zone. Additionally, these throne and kneeling cushions, submitted as Show Us Your Arms, Give What You Get and Embellish It.